Identify and us proper grammar and punctuation. Write a short, research-based article. Self-edit and revise his work. There are sample lesson plans for completing a chapter in 2 or 3 weeks. There are also suggestions on how to schedule more than one child in different levels of WriteShop. There is a list of required and optional supplies that are used throughout the course in the front of the E-book or there is a list at the beginning of each lesson for exactly what is used then. A list of optional books and reference selections is also included. In the teacher helps you can read about how much help you should be giving your student and how you can help them. Each lesson is set up the same way. You have Objectives, Advance Prep, Required and Optional Supplies, and then the Activities. Each lesson has several activities and then a self-editing checklist. The Book D Student Worksheet Pack comes with the Activity Pack. It contains 66 pages of worksheets used to in the lessons. There are pre-writing activities, skill builders, journal prompts, brainstorming worksheets, reading log forms, self-editing checklists, and Junior Writing Skills Evaluation Charts to keep track of the student's progress. 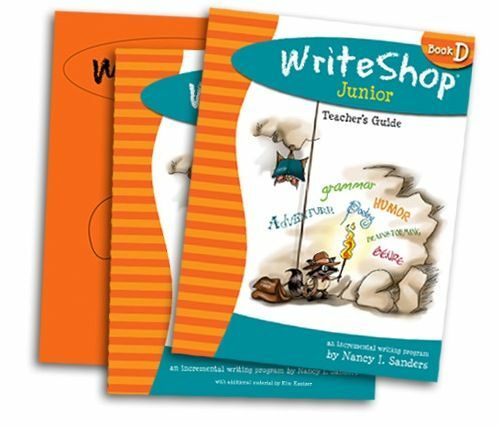 I have been using WriteShop Junior Book D with Aliana, age 9. We have been using the 3 week plan over the summer and it seems to be the perfect amount for this time of year. She actually likes all the worksheets and activities. She doesn't look at this as work, she thinks it is fun. After she completes her worksheets she colors all the cute little pictures on the page. 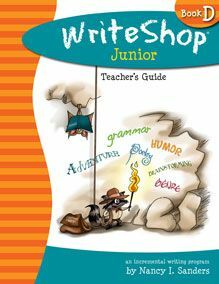 When I was first introduced to WriteShop it was a little overwhelming, but after using it for awhile we got into a groove and it doesn't take that long and when Alaina begs to work on it every day it is definitely worth it. I love the self-editing checklists. She asks for help while she is going through her checklist, but I know eventually she will get better at it and will improve her writing in the long run. The checklist has made her more aware of the mistakes that she repeats every time she writes. I think all the activities are very age appropriate and make learning fun. I have always had my kids write in a journal. It is never graded and they can write about anything they want. I have them use blank paper because they also use it as an art journal, by including sketches, drawings, doodles, or squiggles of anything they want to add. This course also says that you should not grade journal entries. There are journal pages included that have pictures and prompts to help the student. Alaina has been using them also. She likes the pictures that are on the sheets and she tries really hard to use good penmanship on her pages with pictures. Another thing that helps Alaina take pride in her writing is that this series has you actually publish your work when you are finished. Lesson 1 is about writing a Letter of Invitation. One of the activities for this lesson is actually making an invitation. The Fold-N-Go Grammar folders were very easy to put together and they make it very easy for Alaina to find what she is looking for. I'm sure they will become a go to resource while writing for any subject. For example the Fold-N-Go Grammar folder for lesson 2 contains charts of proofreading marks, self-editing tool, tips, and a checklist. WriteShop is also available in the print version. We received the E-book version for all the books and they were very easy to download and print. I printed all the material at one time and set up a three ring binder for all of the worksheets. Members of the SchoolHouse Review Crew received other levels of WriteShop and you can read those reviews on the Crew Blog.